Most documents can be issued in two different ways: automatically or manually. For automatic documents, there’s nothing to see on this page. You should activate them on the settings for Invoices and Credit notes or Delivery notes and chose the order status that will trigger the generation of that document. To issue any of these three documents manually, you should use the Order actions dropdown menu inside the order edit screen on the WordPress backend to chose the document and then click on the > button at the right. The process of creating any document can take some seconds because your server will need to communicate with the InvoiceXpress API, in some situations more than one time, to create the documents. After the invoice is issued, it will be available to download on the Order notes metabox. The client will also receive the document on his email address if you checked that option on the Invoices and Credit notes settings. 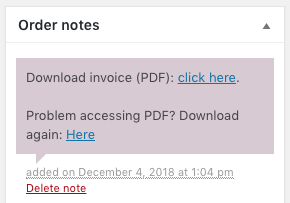 If you also enabled the Issue automatic receipt option that document will also be available to be downloaded next to the Invoice, as well as sent via email if the corresponding option is set. If you are issuing Invoices or Simplified invoices and are being pre-paid, we highly recommend you to activate this option. 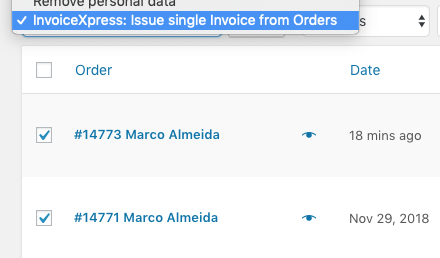 If the same client has several active orders and you want to create a unique invoice for all the orders, you should go into the Orders screen on your WordPress backend, select the corresponding orders, choose Issue single Invoice from Orders from the Bulk Actions dropdown and click Apply. Orders must have the same VAT and the client details will be fetched from the first order, so we do not recommend you use this feature unless you are 100% sure all the selected orders can be, legally and fiscally, invoiced together. If you haven’t activated the Issue automatic receipt option, you can issue it on the Order notes dropdown. Credit notes are created differently from other documents. To issue a Credit note, an Invoice must already exist, and you have to refund the order. Change the order status to Refunded and click the Update button. The order will be refunded to your client (if your payment gateway supports it, or you’ll have to refund him by other means), and the Credit note will be automatically created. 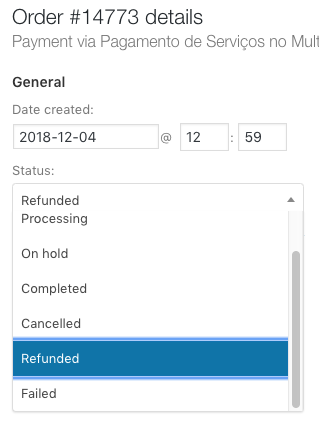 You can also partially refund an order by using the Refund button on the Items metabox and setting the quantities to refund. 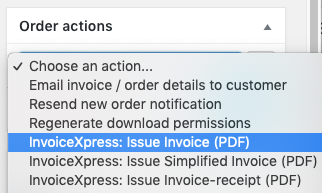 To issue any of these two documents manually, you should use the Order actions dropdown menu inside the order edit screen, just like explained above for Invoices. To issue any of these two documents manually, you should use the Order actions dropdown menu inside the order edit screen, just like explained above for Invoices, but you should first make sure the Loaded at and License plate fields are correctly filled in. You should also be sure the loading address is correctly set on the Delivery or Return guides settings. The loading date/time can never be in the past and the license plate should be filled in if you are delivering the goods on your own company vehicle. It’s possible to cancel the last document issued if it’s an Invoice, Simplified invoice, Delivery note or Return delivery note. Use the Order actions dropdown menu inside the order edit screen to do it. You should make sure you have set a Cancelation reason on the Invoices and Credit notes settings and check with your accountant if this is the way you should do it, instead of issuing a Credit note. Be advised that it’s also not possible to cancel an already paid document (if you issued a Receipt or a Invoice-receipt).